Does cauliflower count for detox? That’s what we are supposed to do for at least one week in January, isn’t it? Have you done the salad treatment and figured it’s bad for you since there’s a foot of snow outside? It’s too cold for self-inflicted punishment. I am so glad is not bikini time yet. That’s even worse than New Year detox. Lucky me I don’t even wear a bikini anymore. As a consequence I can have this wholesome, gluten-free food which is every bit as good and crunchy as any gluten equivalent. Not bad for a healthy dose of veggies and – as an added bonus – is wonderfully easy to digest. Preheat oven to 200° C/ 390° F.
Using my food processor method for sweet pastry, make the savory shell using the tapioca and glutinous rice flours, 2 eggs, 1/2 teaspoon salt, 2 tablespoon Parmesan and enough cold water to obtain a firm dough. I have tried to make pastry with various gluten-free flours but this is by far the easiest and most consistent in terms of structure and flavor. Line a 10 inch ( 25 cm) tart pan with parchment paper. Roll the dough into a 1/2 cm (1/4 inch) thin disk and transfer into the tart pan so to make a case with shallow sides. I roll the dough onto a clingfilm sheet and then I flip it into the lined tart pan. Cover with the clingfilm and transfer in the refrigerator for at least 1/2 an hour and up to half a day. This crucial step will give you a crispy shell. Blanch the cauliflower florets in plenty boiling water, drain. Saute 1 finely minced clove of garlic in 2 tablespoon olive oil until fragrant. Add cauliflower florets and saute briefly to infuse in the garlicky oil. Season to taste with salt and black or red pepper. Set aside. While the cauliflower is cooling, whisk 3 eggs with 1/2 cup milk and the rest of the grated parmesan. Transfer the cauliflower into the pastry shell and top with diced Pecorino cheese making sure to push the cubes in between the florets. Pour the egg mixture over the tart and transfer into the oven. 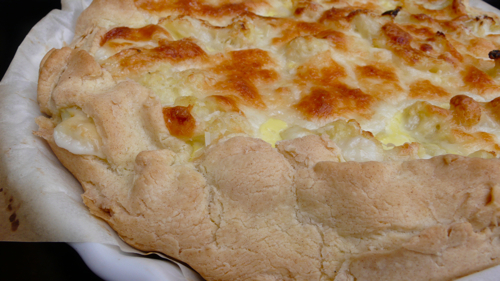 Bake the crostata in middle of the oven 45 minutes, or until the crust is golden. We love it hot from the oven but it’s still good at room temperature. Serves 4 as a vegetarian main, 6 as a side or appetizer. PS. If in a hurry, using good quality store-bought puff pastry is a quick alternative to the pastry shell. In this case it’s obviously not suitable for a gluten-free diet. Ah, Letizia, you had me at “pecorino”! it has to be there, doesn’it?